Happy New Year! I wish you and yours a wonderful and interesting 2014 – interesting in a good way, of course! How was your 2013? Good I hope – although many people, I know, were challenged this past year. Gambatte! My 2013 was a bit different from past years. A year for introspection, perhaps. In 2012 I traveled quite a bit, perhaps it was my mid-life musha shugyo. I looked back over my theme of 2013 and was flabbergasted by the many things I did and places I visited. Of course, I did do some travelling in 2013, but not as much as that last few years. I really needed to stay at home more – and train on my own. As a musician, I know for every hour I perform on stage, I must put in many, many more hours of practice at home, "woodshedding" by myself. I think it is the same with martial arts. I am flattered to be asked many places to teach, but how can I continue to do that if I don't keep improving myself? How can I teach something if I can't do it? Anyway, as I said, I did do a bit of traveling in 2013. 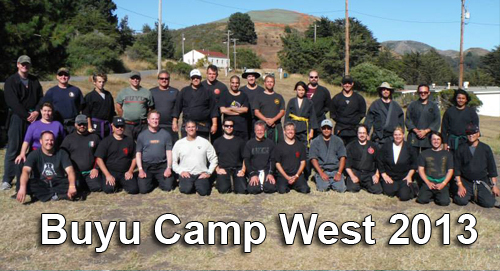 Our group enjoyed the Buyῡ Camp West in San Francisco under the Golden Gate Bridge on the Pacific Ocean. 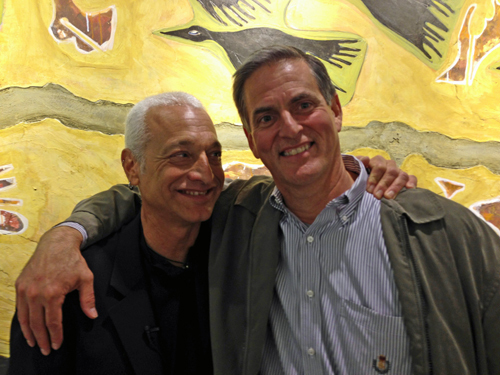 As has become custom, the event was in honor of Mark Hodel. 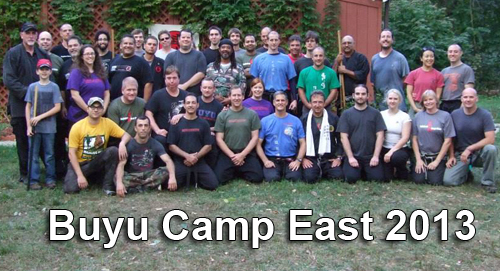 We enjoyed another Buyῡ Camp East in New Jersey. Steffen & Michaela BYCE 2013 A little bojutsu, of course! 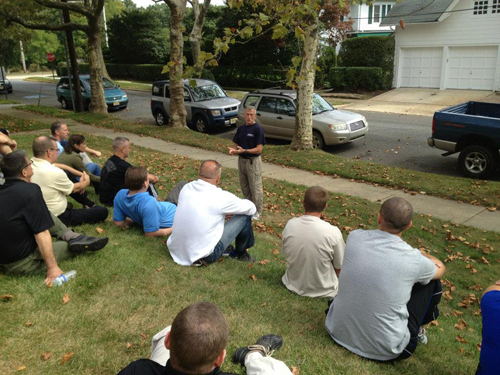 We had training seminars in NJ and California. I visited Paul Fisher, Ed Figueroa and the guys and gals in Florida twice. 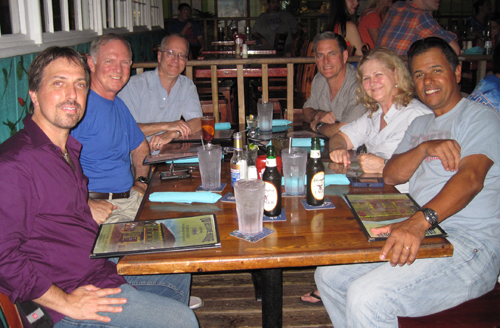 Post West Palm Beach Training libation in November with Ed, Claudia, Gary and Ken. Second from left is Carson Cox, one of the original 1980 San Diego training guys! I was in Chicago with Jim Morganelli and his group. I also visited Bogotá, Colombia with David Palau and his group. And then Atlanta with my old friend Bud Malmstrom. 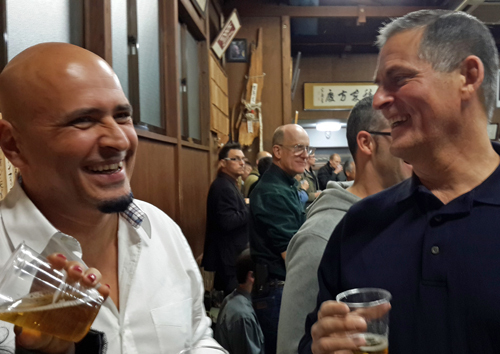 I went to Japan to celebrate Hatsumi Sensei's birthday and get in some more training – especially bojutsu with Noguchi Sensei (more about that later). The age of the big Daikomyosai training extravaganzas appears to be over, but Hatsumi Sensei is still training and had some very interesting things to say. I had a chance to train with my friends Doug Wilson and Shawn Gray. Shawn captured the points that Sensei was making in a recent post. "Don't think - thinking fogs your brain," Soke said, specifically addressing the 15th dans. Lower ranks can go ahead and think, he clarified. Use the body for everything. Even if the feet don't move, the body moves. Learn to move all parts of your body independently. Don't lead with your head. If you do, the attack will "come to your head" ('Atama ni kuru', also a euphemism for 'losing your cool' in Japanese). Don't struggle against a resisting opponent - wrap them up instead. Use the image-making faculties of the mind against the opponent and to your own advantage - create impressions of things that aren't there, and use the opponent's response to have them put the technique onto themselves. Here's some fun photos from the trip. A little post training lunch and talk. Pedro & I enjoying the Buyῡ feeling. Pedro will be in NJ in June! Enjoy yourself and keep going!! 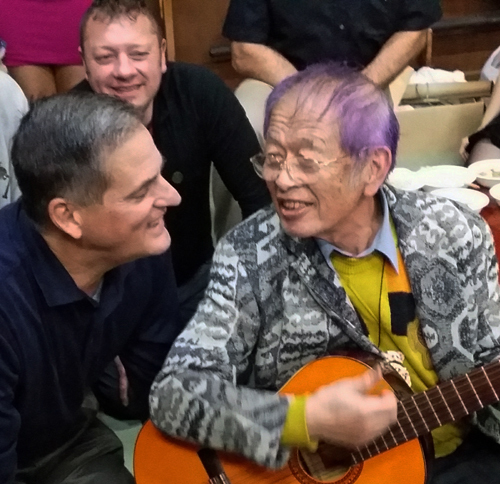 I've been in Japan for the last thirty-three years in a row for Sensei's birthday. Time flies! 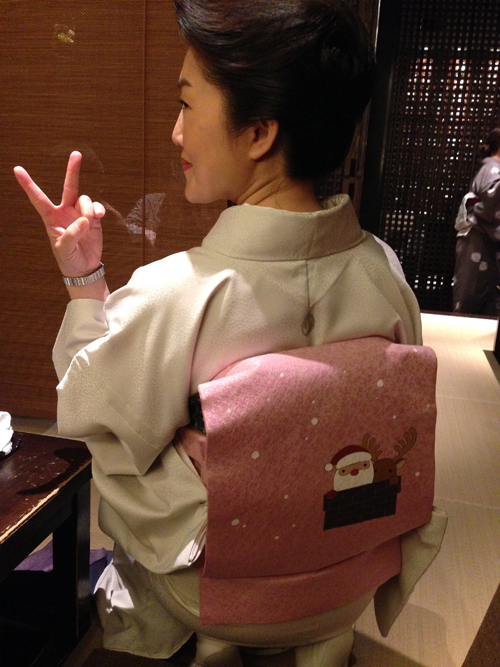 And it just doesn't feel as if the Christmas Season has truly started until I get to Tokyo. This Mama-san has it going on! That was not so much travelling, was it? Well, maybe a few more stops next year, including Switzerland, Germany, Colombia, Chicago, California, Florida and who knows where else? Check here for upcoming seminars. And there are many more pictures on our Buyῡ Facebook page here. An old California Buyῡ friend of mine, Kenny Feld (aka Yisrael Feldsott; aka Logan Wolf) had an exciting art exhibition in 2013 that I was privileged to help produce. It was called "My Enemy." "My Enemy" is a challenge to all of us to see how others we are tempted to call enemy are actually much like us. He travelled cross country engaging people on the subject and then had an exhibition in a New York City gallery and at the Tibet House. You can read about the "My "Enemy" Project here and check out some of Kenny's extraordinary paintings. My book "The Ethical Warrior," is doing very well. 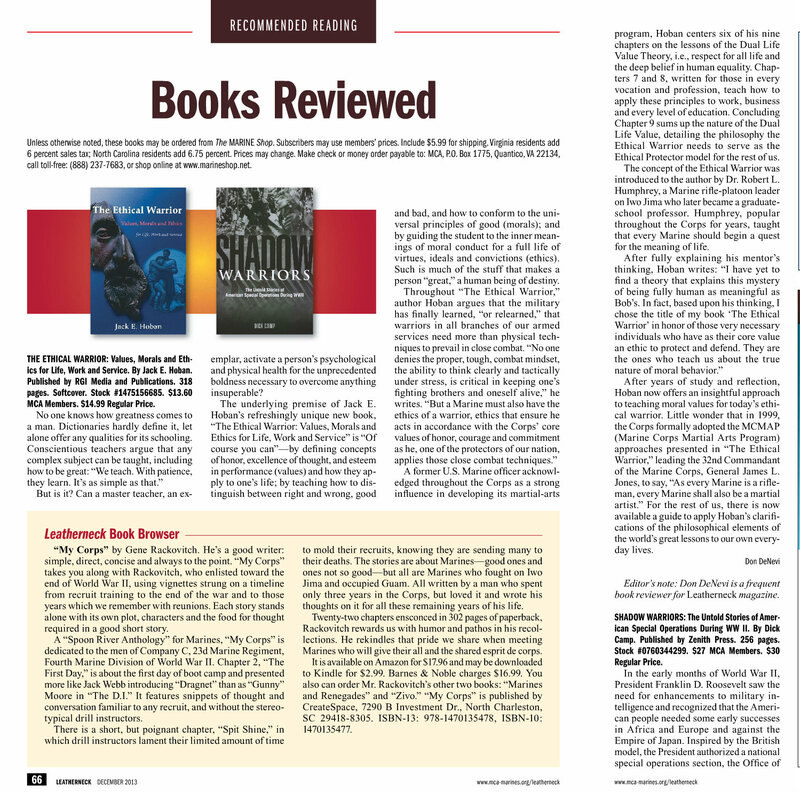 It even was reviewed in the Marine's Leatherneck Magazine. Click it if you want to read it. If you haven't read the book and are interested you can get more info here or on Amazon.com; it's even available for Kindle. And by the way, you can now start calling me Professor Hoban. Only kidding! But I was asked by the J. Mack Robinson College of Business at the University of Georgia to be an adjunct professor of their Center for Ethics and Corporate Responsibility. The Director, Dr. Steven Olson has been working with my company, Resolution Group International, on applying the Ethical Warrior principles and Dr. Humphrey's Dual Life Value theory of human nature to business leadership and ethics. This is very exciting work (and a little controversial) as it runs quite counter to what is being taught presently in business schools. 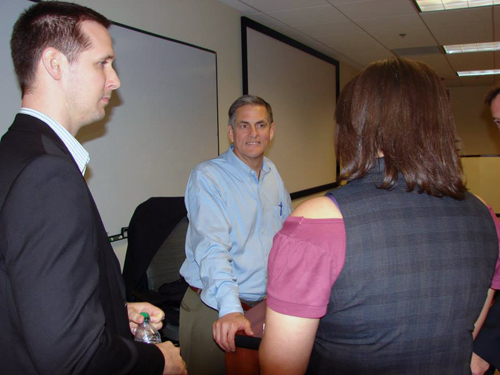 I went to Georgia and did several presentations and classes on ethics and leadership at Steve Olson's invitation. We have big plans for 2014. 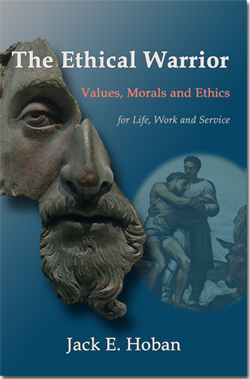 Maybe even a business book based on the Ethical Warrior concepts! As you may know, RGI is made up of military and law enforcement professionals who teach how to resolve conflict under stress. 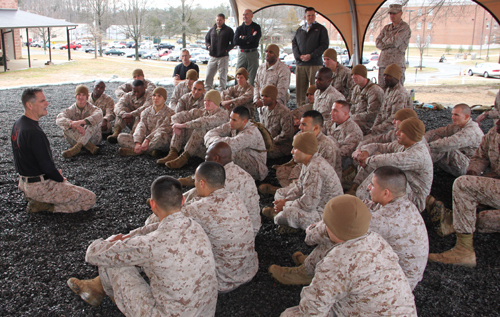 The RGI curriculum extrapolates on the work I have done with Robert L. Humphrey and the Marines in the areas of ethics, conflict communication and physical protection skills. 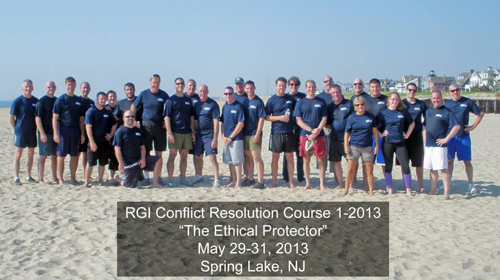 We had two more RGI Conflict Resolution Courses in 2013 with participants from the NYPD, NJ State Police, the Park Service, Marines, Fortune 500 and many more. The infamous RGI beach workout! Joe Shusko giving one of his patented "tie ins"
Another fine group of Ethical Protectors! 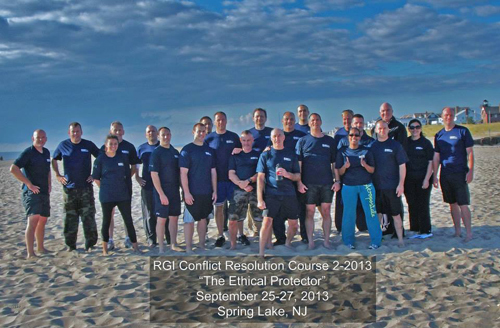 If you are interested in learning how to apply the Ethical Protector training as a law enforcement or military professional – or just want to explore the concept with the top-notch RGI instructors in a hands-on setting as a civilian warrior – check out RGI Events. 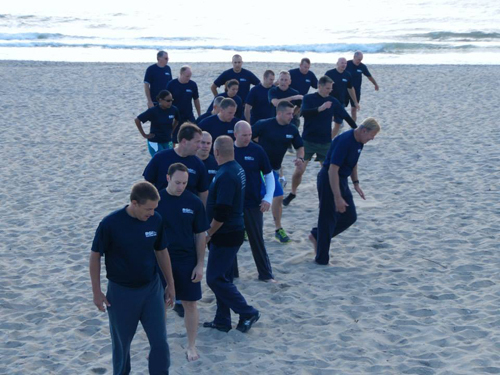 To see more training photos, you can "like us" on Facebook here. 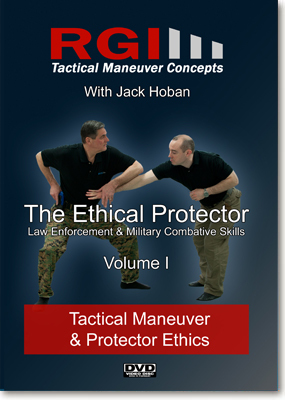 As a representative of RGI, I had the honor of sharing the Ethical Warrior concept with many law enforcement professionals at the International Law Enforcement Education & Training Association (ILEETA) trade show in Chicago for the third time last April and it looks like I will be on the agenda again in 2014. See you in Chicago! I was also asked to be the keynote speaker at the "Beyond Conflict" conference in Milwaukee last November. It was billed as "The Must-Attend Event for Anyone Who Deals with Conflict." This was very exciting because I had the opportunity to deal with conflict resolution professionals of many walks of life from all over the country. Thanks to Gary Klugiewicz from Verbal Defense and Influence and all the folks at Vistelar for inviting me to this great event. Next year I think it will be in St. Louis, if you are interested. I had the privilege of speaking to some great police officers in Ottawa, Canada about the Ethical Warrior concept. Read about my adventures here. Thank you Sgt. Pete Danyluk and all of the ethical protectors of the OPS! 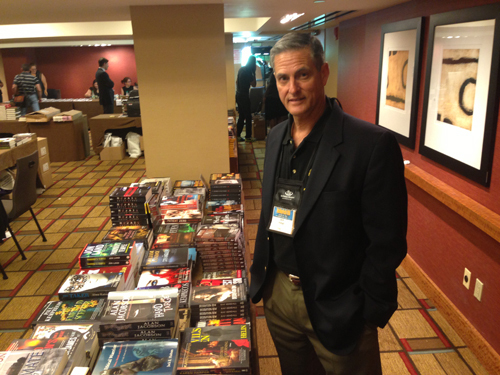 I also gave a presentation on how to write fight scenes at "ThrillerFest," a writers' convention in NYC – thank you Joe Finder and Kimberley Howe! RGI also has three videos, now. Check them out! 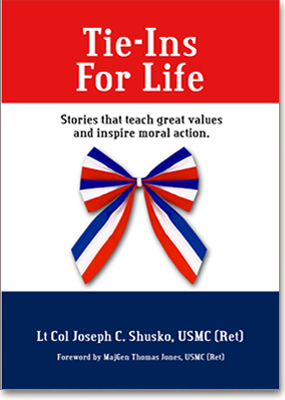 And don't forget Joe Shusko's book, "Tie-Ins For Life." Resolution Group International is in it's fourth year and continues to flourish and make an impact. Lot's planned for 2014. And, as I said, you can see many more cool RGI pictures here. 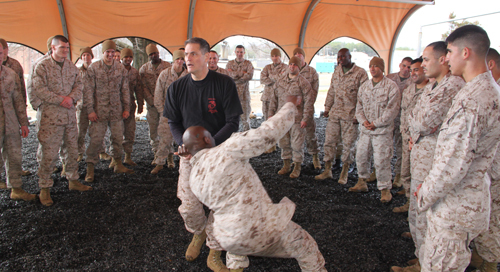 This past year I was again privileged to work with the Marine Corps Martial Arts Program (MCMAP) in Quantico, Virginia. 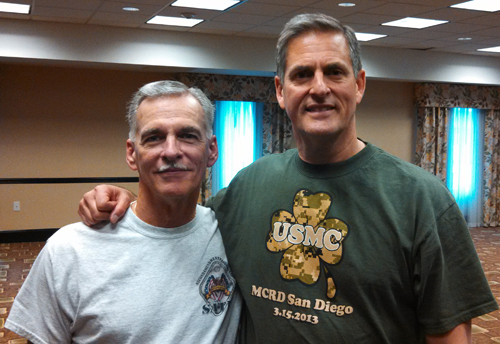 This important program is led ably by LtCol Hank Weede and my good friend Joe Shusko (LtCol USMC ret.). 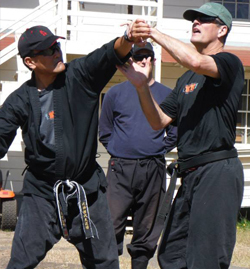 It covers armed and unarmed martial arts techniques, combat conditioning, mental training and character development. I can't say enough about these young Marines. They are physically and mentally tough, yet respectful and ethical. Many are veterans of both Iraq and Afghanistan. The methodology we use is simple but vitally important: train a lot, talk a bit, train a lot, talk a bit. The Marines relish the physical training, and then are open to hear how to use their training and core values to maintain their ethics and a "protector mindset" under the adversity of war. 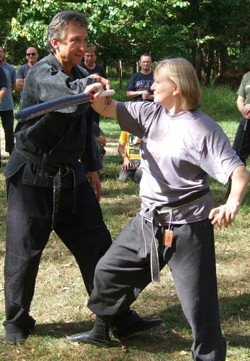 In martial arts training, it is often easy to focus on the physical part while giving mere lip service to the mental and character elements. But all three parts must go together. 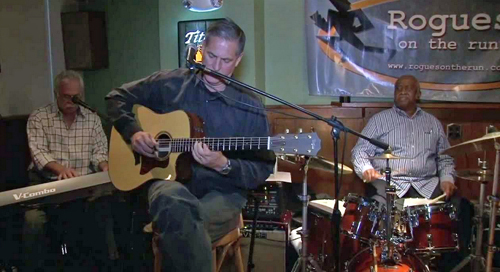 I said I really wanted to play more music in 2013 – and we did! 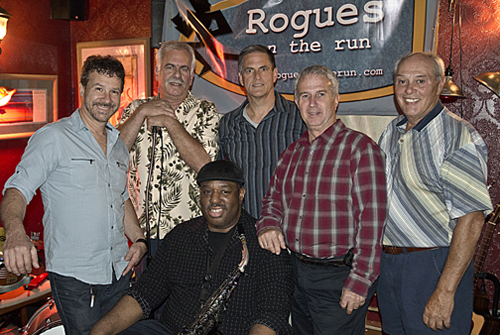 Our band "Rogues on the Run" had a fun year and played quite a bit. We even did several gigs with legendary drummer Bernard Purdie (Aretha Franklin, James Brown, Steely Dan, Hall & Oates, Alan Jackson, etc. etc. etc.). Bernard "Pretty" Purdie on drums! 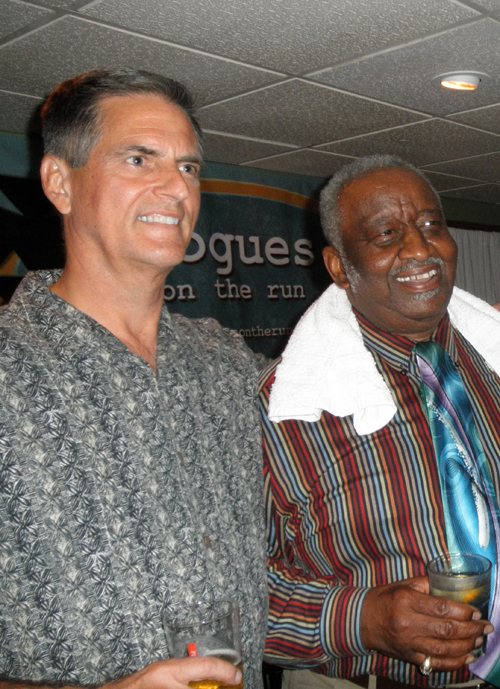 Jack & "Pretty" Purdie - always a privilege! Check out some more of our videos here. Whew! 2013 was a pretty action-packed year after all!! So, what about 2014? Our 2013 goal was to become stronger and more flexible. It evolved into what we called training from the "inside out." It was inspired by an observation. 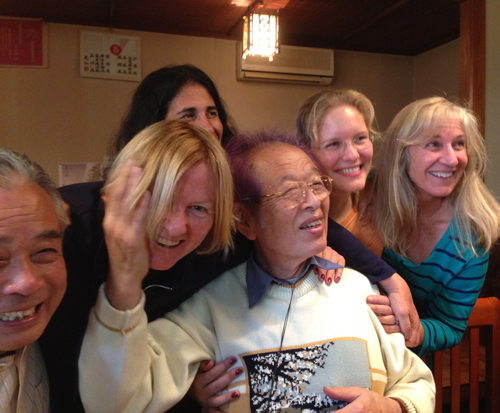 I was puzzling over why Hatsumi Sensei and Noguchi Sensei seemed to be getting "stronger" while at the same time moving ever more effortlessly – and without exhibiting any of the big muscles we normally associate with strength. 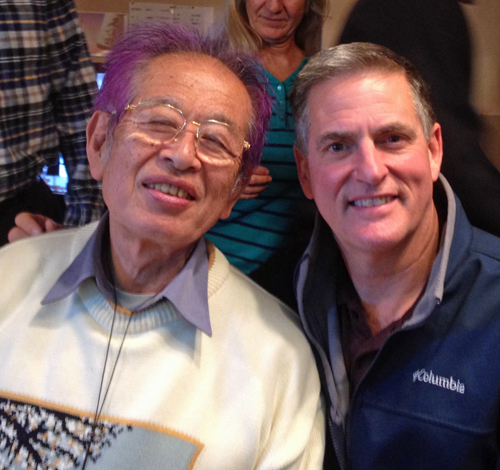 One clue was that Noguchi Sensei had been working very hard to earn his menkyo kaiden masters certification in bojutsu. A bo (6 foot staff), being of relatively light weight, is a perfect tool for exercising (and strengthening) the small muscles, connecting tissues, ligaments and tendons in the hands, arms, shoulders and back. Effective bojutsu requires the practitioner to "organize" himself, inside-out, from the core. An organized body with strong connecting tissues – when employed through the trunk, legs, feet and toes using proper taijutsu movement – is a very powerful combination. If you trained together with us in 2013, you know how seriously we took this concept. I hope you got as much out of it as I did. The other point that we extrapolated out of this was that it is not only effective movement that comes from the inside-out, but ethical behavior. There are uncountable laws, rules and regulations in our society – yet we still have so much criminal and unethical behavior. The fact that so much of it comes from our so-called "leaders," is especially troubling. But here's the rub, laws are "outside-in" controls; they may serve to regulate our behavior, but they can't make us ethical. Ethics are inside-out. It is a little bit like maintaining a proper body temperature: it can be cold out, it can be hot out; we can turn up the heat, turn up the AC; put on more clothes, take some off; but it is fundamentally our inside-out, endothermic process, that has the job of keeping us at a nice 98.6 degrees Fahrenheit. As far as our budo is concerned, it is not enough that we look good on the outside: that we have the right do-gi, patch, rank, or have pictures with the coolest teachers – or even look good doing every waza and kata. We have to have true internal strength – physical, mental and moral strength – that can be focused into effective life-protecting action on behalf of self and others. That is the purpose of martial arts. So, those of you who have been training with me on this inside-out concept be forewarned. We are not done with it. In fact, we are just getting warmed up! 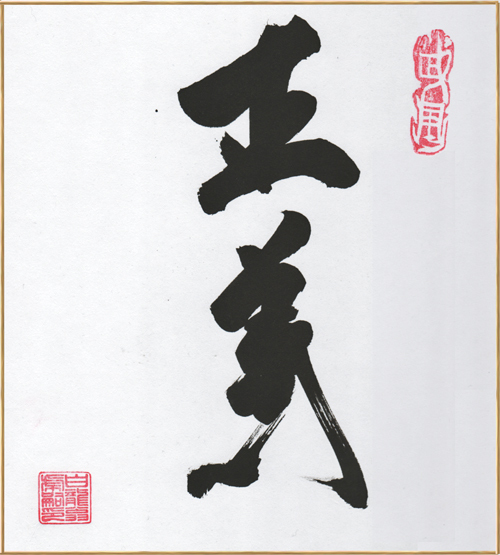 In personal conversations with Hatsumi Sensei this year, he used the term seigi (justice) over and over. I think that it is his way of encouraging us to "keep going," to see beyond the techniques and "outer trappings" of martial arts to the core. I read recently that justice "is a concept of moral rightness based ethics, rationality, law, natural law, religion, equity and fairness, as well as the administration of the law, taking into account the inalienable and inborn rights of all human beings and citizens, the right of all people and individuals to equal protection before the law of their civil rights, without discrimination..."
Calligraphy of Seigi by Masaaki Hatsumi - from author's personal collection. Yes, I believe this is the purpose of martial arts: attaining justice. But, again, I don't think we can rely only on outside controls to "impose" justice on us. I think all of us, particularly those called to the warrior vocations, must use our moral, verbal and physical skills to manifest justice in our lives, in the lives of others, in our communities, in our countries. In the world. To the extent we can. That is the role of an ethical warrior. And this all has had me thinking. To attain justice requires a a san shin, of sorts. We have to desire justice for all (not just for ourselves), we have to speak justly, and we have to act justly. Thought, word and deed. 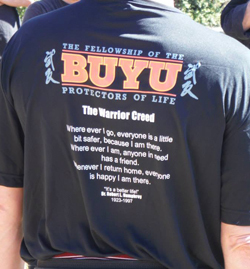 I have worked to clarify the concept of an ethical warrior in my own mind. 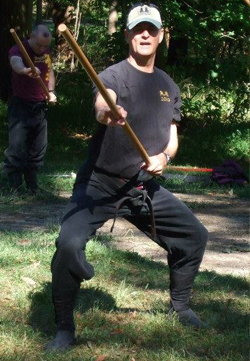 Physically, I have strived to learn the skills of an ethical warrior through constant practice and training. My weak point, I think, is my verbal skills. Like most of us, I am not as adept as I could be at resolving conflict with words. In fact, most of the conflicts I am in are a result of something I said or how I reacted to what someone else has said. I have begun to think "peace-talking" is an important, yet under-practiced, skill of the ethical protector. Sensei uses this skill all the time. In fact, if you try to say something negative to Sensei he often deflects it or changes the subject, bringing the conversation back around to something positive. At RGI we practice the verbal peace-talking skills of Verbal Defense and Influence that I learned from George Thompson, Gary Klugiewicz and elsewhere. There is decades of research indicating that, in conflicts, the right word or words can be the difference between de-escalation into a peaceful resolution – or escalation into a violent and unfortunate result. And we now know what those words are and have methods of learning how to use them effectively. 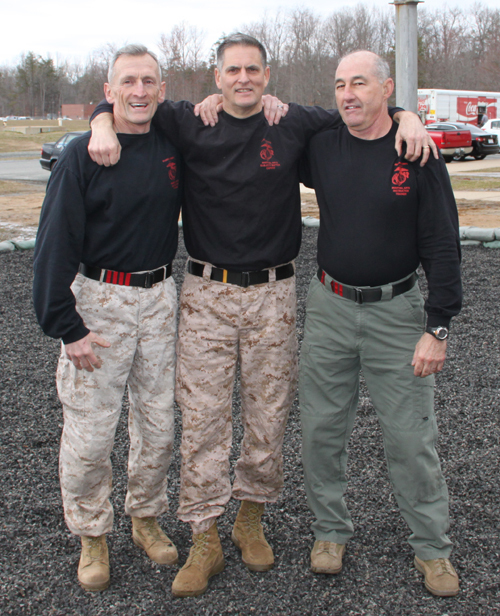 One of our RGI mentors, Chief Jim Challender (Marine and retired NJ State Police Commandant) likes to say "some guys can coax a rabid dog off a meat truck, while others can go to a baby shower and start a riot; just by the way they talk." I am interested in studying how a more synergistic combination of thought, word and deed can be used effectively to resolve conflict. Many people talk big, but don't follow through; that's a big problem. But many of us so-called ethical protectors, although we may have physical skills, are not all that expert when it comes to resolving conflicts verbally. For example, look at the "militarization" of the police. Many departments seem to be forgoing verbal conflict resolution for "outside-in" technologies – more cameras, more swat teams, more armored vehicles. This can't be good. Even our personal lives often suffer from poor communication skills. Petty arguments with spouses, co-workers, TEENAGERS, strangers. Are we as adept as addressing these conflicts as, say, a right punch to the face? 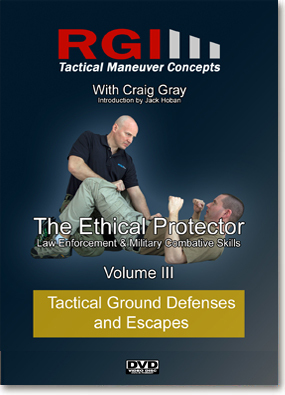 Let's say we are in a real physical conflict and we are required to subdue an opponent in order to protect ourselves, others – and even the attacker, if possible. What might we say during the altercation? Do we know what we might say? Is what comes out of our mouths something that will actually help the situation? Have we practiced talking as part of the "technique?" Somehow I doubt that screaming "I'll kill you M***** F*****!" when taking someone to the ground will actually make truly violent people want to relax and comply. So what could we say that might make them more inclined to relax and comply? 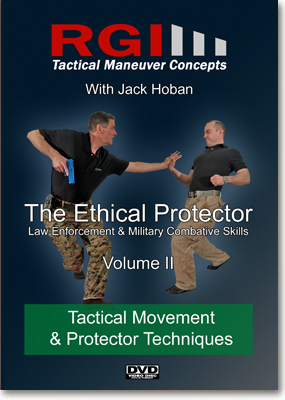 And, when dealing with bad guys on the street looking for a fight – or looking for a victim – tactical communication skills can be a literal life saver. The whole topic of conflict communication is fascinating and I will be looking for ways to integrate it into the actual physical training. So here is the theme of our Buyῡ training this year: Thought, WORD and deed. Let's explore how words can become a more effective tool in our quest to become ethical warriors. No, we are not going to relax our physical or mental training regimens. We are going to try to bring our verbal skills up to the level of our mental and physical skills. San shin is like a three-legged stool: all three legs kind of have to be the same size, don't you think? Be more positive and respectful in the way I communicate – especially under stress or when involved in a conflict. Research speech patterns (waza?) that are proven to be effective for de-escalating conflict. Speak less crudely overall (curtail the cussing and swearing). 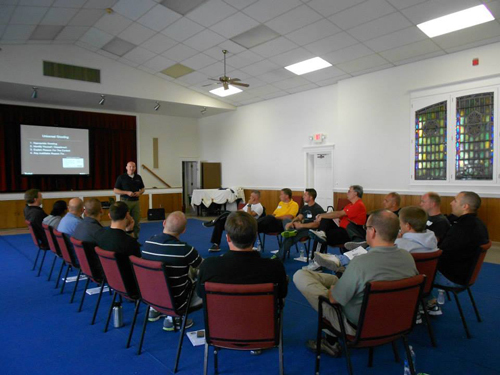 Practice "peace-talking" at within the physical training – when appropriate, of couse.. 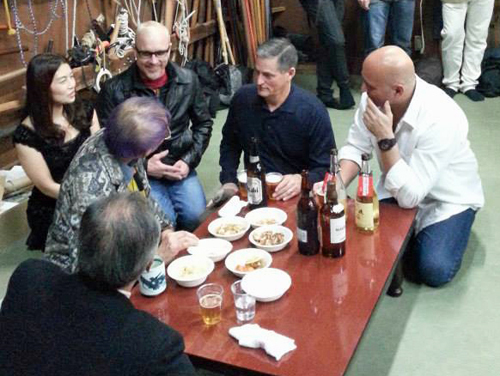 Explore how peace-talking can actually improve the physical outcome. Interesting, neh? So, let's enjoy ourselves and do our best!